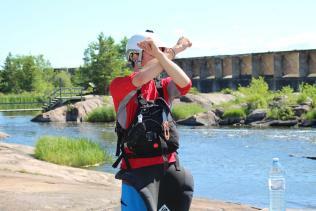 Whitewater kayaking with Prairie Whitewater: we did it and you can too! 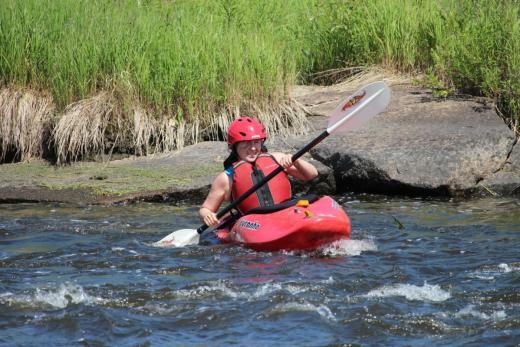 From weekend canoe trips to kayaking at the cabin, everyone knows paddling is big in Manitoba. What you might not know (or expect) is that our province is also home to some of the best whitewater rivers in Canada…and Prairie Whitewater wants to get you on them. 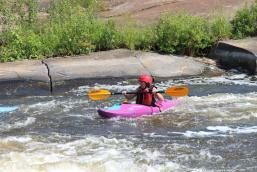 Prairie Whitewater’s Steven Walker shows off his skills on the rapids at Pinawa Dam Provincial Park. 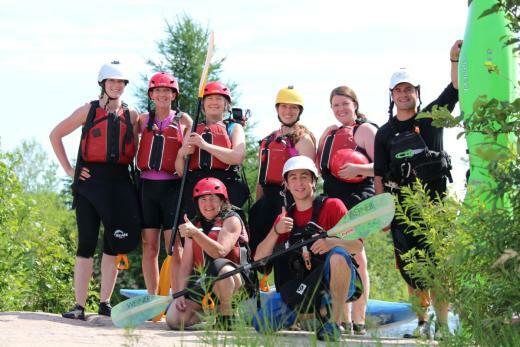 A new Manitoba company focused on introducing as many people as possible to whitewater kayaking, Prairie Whitewater offers courses and clinics across the province designed for students of all skill levels…including our inexpert group of Travel Manitoba staff members. Could a one-day course get us all ready to tackle the rapids? We were about to find out. 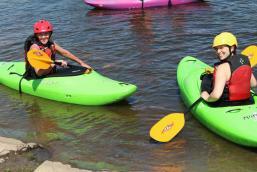 Prairie Whitewater is making whitewater kayaking accessible to more people. 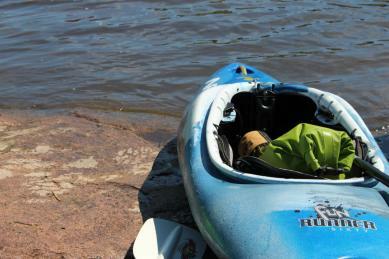 Our key to adventure on Manitoba’s waterways. We pulled into Pinawa Dam Provincial Park at 10 a.m. ready for the start of their “Whitewater Crash Course”, a day-long offering designed for groups like ours with little to no experience. With a cloudless blue sky and a forecast of 30+ degrees, we couldn’t wait to get on the (white) water. Our beautiful classroom for the day. 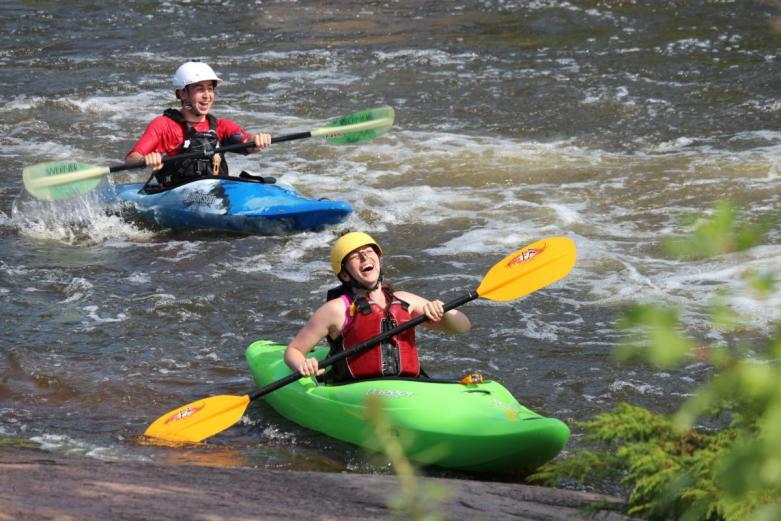 Prairie Whitewater provides all necessary equipment for students, including kayaks, helmets, PFDs and sprayskirts (that’s the neoprene sleeve that creates a watertight seal around you and your kayak). Owner/lead instructor Steven Walker and his assistant Colin Gisiger got our group outfitted in the parking lot before we carried our kayaks down to the water to start the flatwater portion of the day. 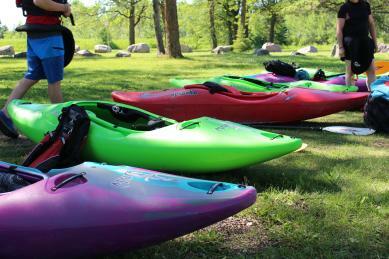 Our fleet of whitewater kayaks. Carol and Nancy show off their new sprayskirts. After learning a few hand signals for communicating on the water, we got into our kayaks to learn the most important skill of whitewater kayaking: how to get out! Steven walked us through the progression of calmly rolling underwater, pulling off the sprayskirt and swimming out safely. By the time we were finished, we were all popping out upside down and underwater without breaking a sweat. Bring on the rapids! The signal for “not okay”. Don’t worry, we didn’t use this one! Linda and Colin look on as we learn basic water safety. 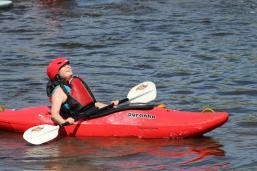 Learning to keep calm underwater and safely exist the kayak. …well, not really. But we were ready to move on to paddling, sweep strokes and edging in the still water near the dam. Prairie Whitewater teaches every new skill as a progression, so even a complete novice like me was able to get a good grasp on the fundamentals. A few unplanned kayak rolls gave me the chance to practice my underwater exits too! After a lunch break and a brief hydrology lesson, we were ready to hit the moving water. 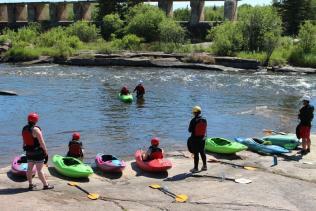 Moving our kayaks upriver towards the rapids. Any nervousness I had before getting into the river washed away as soon as we hit the current. The skills we practiced on the flatwater were actually easier in moving water, as our kayaks transformed into lithe river racers carving us in and out of eddies. After that very first thrill of the water catching you it’s already easy to see how whitewater riding can get addicting. Carol catching the current on an “eddy-out”, a turn to move from the still water of an eddy into the main current. Steven explaining the next steps to move down the river. Linda and Tamara wait for their turn to enter the moving water. The grand finale of the day was tackling the big rapids. After watching the pros, we launched into the calm waters upstream to scope our own lines down. Steven taught us a whitewater trick to fight pre-rapid jitters: splashing water in your face slows down your heartbeat and focuses your mind. A few face splashes later, we were ready to go. The top of the rapids. So how does it feel to ride the rapids? Words can’t describe it. It’s the perfect mix of excitement and adrenaline backed by the knowledge that you’re totally safe with Prairie Whitewater’s team in the water with you. As the pictures show, we had a pretty great time. Group photo at the end of our day on the water. Carol savouring the end of a successful run. Nancy cheering on her way out of the rapids. Tamara celebrating a flip-free trip through a challenging line. In the end, every single one of us made it through the rapids successfully. We went from complete whitewater rookies to successful rapid riders in under eight hours. What a perfect way to enjoy a summer day in Manitoba! Having the time of my life on the whitewater. Carol finishing her line through the rapids. Carly catching an edge in the river. Nancy splashing down after a successful run through the rapids. Tamara paddling out of the spray. 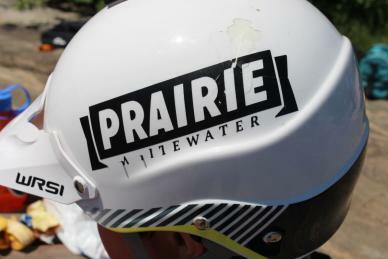 Prairie Whitewater is ready to get you on the river! 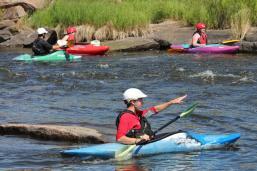 Visit their website at www.prairiewhitewater.com for more information or to book a spot for yourself this summer. I'm the senior digital marketing manager at Travel Manitoba. When I'm not in front of a computer I'm outside living my best life in my home province! I'm always looking for new places to explore, so if you have recommendations you can email me at akrosney@travelmanitoba.com.